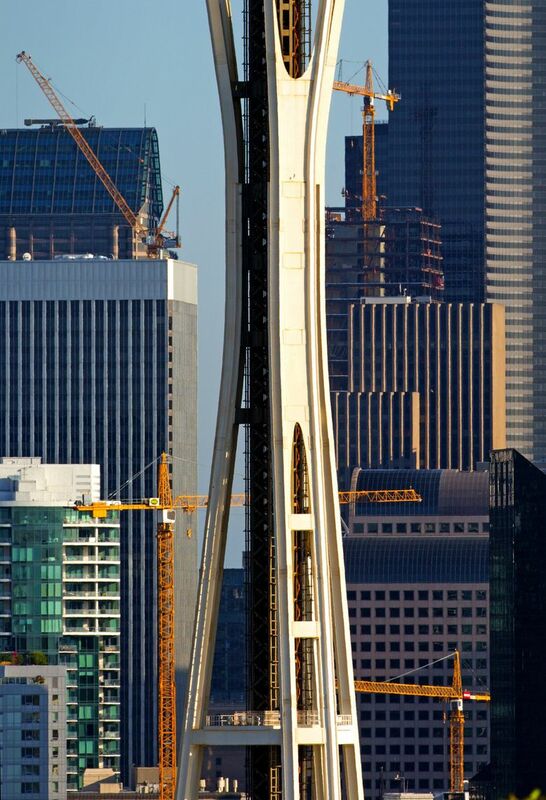 Seattle now has nearly three times as many cranes as New York City despite being a fraction of the size. Chicago threatens to catch up, though. 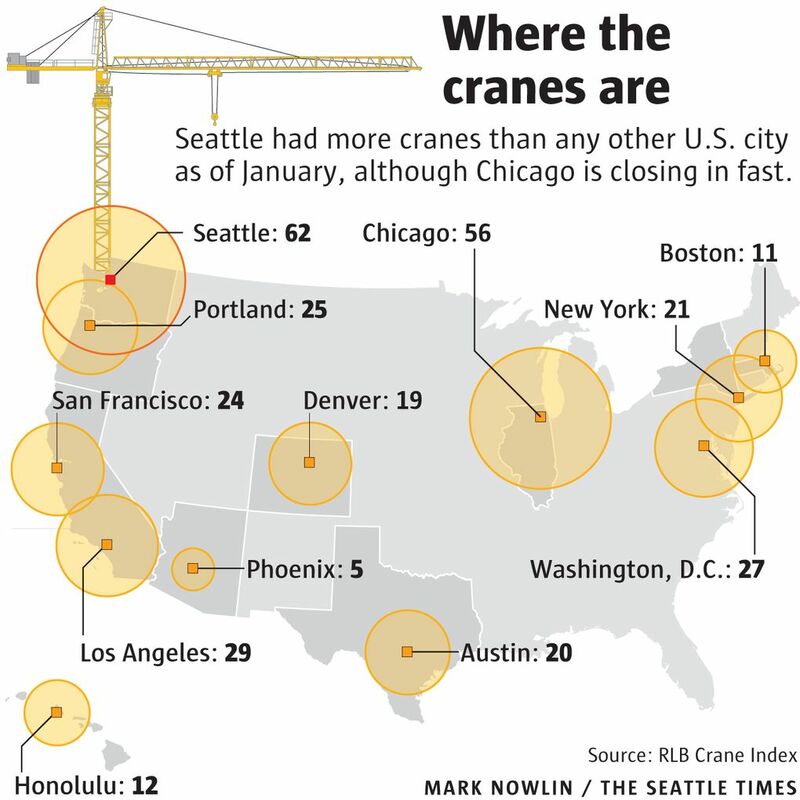 Seattle now has nearly three times more cranes than New York City, which had led the country in 2015. Seattle has more than San Francisco and Portland combined. It has more than Boston, Denver, Austin and Phoenix put together. The crown for most cranes, first awarded to Seattle last year, has come to symbolize the sheer scale of the construction frenzy remaking neighborhoods from Sodo to South Lake Union to Ballard. The towering yellow arms are often the first thing you see when entering the city, and in some spots it’s possible to spin around and spot a dozen or more cranes from one vantage point. Seattle remains behind Toronto, which has 81 cranes, for the North American lead. In Australia, the Middle East, and elsewhere, there are cities where more than 100 cranes are at work. In Seattle, crews packed up quite a few cranes to depart construction sites last year, but they are often quickly replaced on the skyline as another new project starts up, the Rider Levett Bucknall report says. Crane companies say the construction equipment, which can stretch 600 feet in the air and cost $50,000 a month, is often booked several months in advance. Most of the cranes are in or near downtown Seattle, but they pop up across the city. The majority are for apartments, with the city expecting a record 10,000 new units to open this year, although office, condo and hotel projects are springing up, as well. 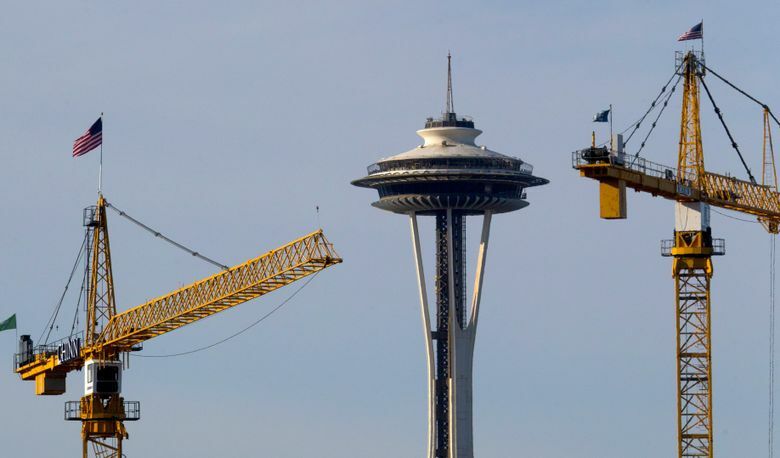 Unlike cities such as New York, Chicago and Los Angeles, which have seen their crane counts fluctuate wildly in the last two years, Seattle’s tally has held mostly steady as of late. The most recent increase goes against the nationwide trend: Chicago and Portland were the only other cities tracked that saw growth in cranes in the latter half of 2016 compared to earlier in the year. Most cities saw a small drop in cranes. The RLB report doesn’t count local cranes outside the city of Seattle, but the Eastside had about 20 cranes as of the last count there, a year ago. Officials in Bellevue say the city currently has eight cranes.